Varsel, thank you for that! Very nice work with your vegetation renders, will have to give it a try !!! Diomede - in favour of leaving the rat in the Soylent Green chamber. Looking forward to your take on the Fifth Element Parody ! Wendy - nice find, are you joining in the fun or sitting this one out ? All you lurkers - join in !!! Bunyip - your underwater scene is fillin out nicely. I still wouldn't swim there! Still Gathering Toon Parody Assets - Suggestions Welcome to Improve My Toon Postwork. This is an example of using the passes. For the final, I wn't make the shadows so dark that they blot out everything. Here is what I did. 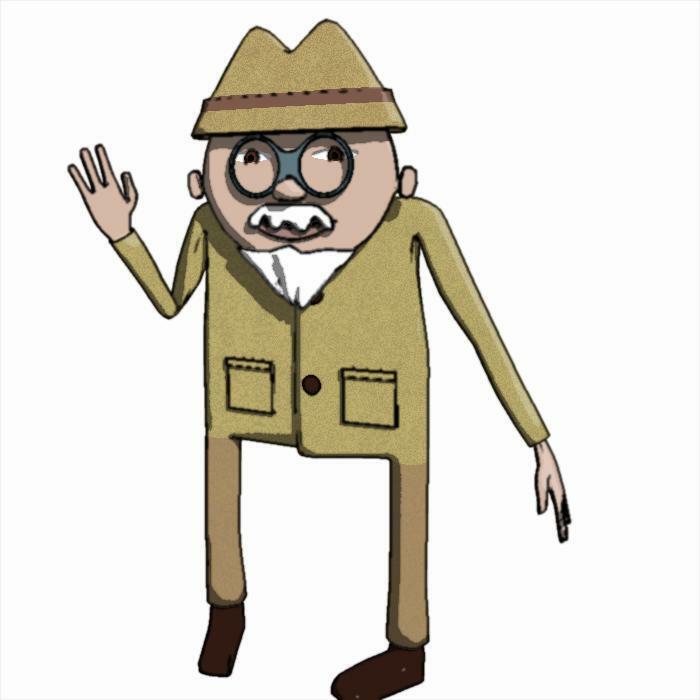 I morphed my base toon flat guy and added props (beard, pockets, hat...) to create the archeaologist. I rendered out multipasses fr th shadow pass, the coverage pass, and the post effect pass. I rendered using the native Toon filter. In Photoshop, I combined the coverage pass and the shadow pass using the "darker" function to get outlines and shadows. I the result as a multiply enhance the toon effect. After using th mltipass to darken the lines and shadows. Here are the render passes. (Straight, coverage, post effect, shadow). You really nailed that character, Diomede. Very creative, yet familiar. I like the straight toon filter best. Excellent, @MAJourney. Looking forward to your ideas. Thanks for your comments on my toon professor, @UnifiedBain and @Bunyip02_Carrara. After I get the weightmapping sorted out, I plan to make more characters from the same base. EDIT: I've created a new version of the base character rigged in Studio, so I have a Carrara bones version and a Studio bones version, both of which load in Carrara. Will report on comparative performance. Remarkable likeness and nice model! i'm no hair stylist, but here's my attempt at making a spiky hair in he shape of fire. @VYusur - thanks, the video parody inspires me. I'm still searching for my own style, but in the meantime I love different toon / comic / caricature approaches. @MAJourney - thanks. If the professor toon creeps you out now, wait until the one-eyed evil dude makes his appearance! Love your hair. Here are a couple of unsolicited suggestions regarding the hair shaders. Read on at your own risk because I am no expert. One suggestion is that the hair shader can be used for additional styling, and in this case you might consider a small wave and small frizz (experiment and discard if it doesn't work well). Second, you can place mxers in the channels for the root and tip colors of the hair shader. You might consider mixing your current tip color with something yellowish, and then use NATURAL : SPOTS : (around 50), to control the blender for the mixer. Here is an example of hair grown on the Daz hair cap that I believe shipped with Carrara 8.5 in the object browser under Objects : Hair : Daz. 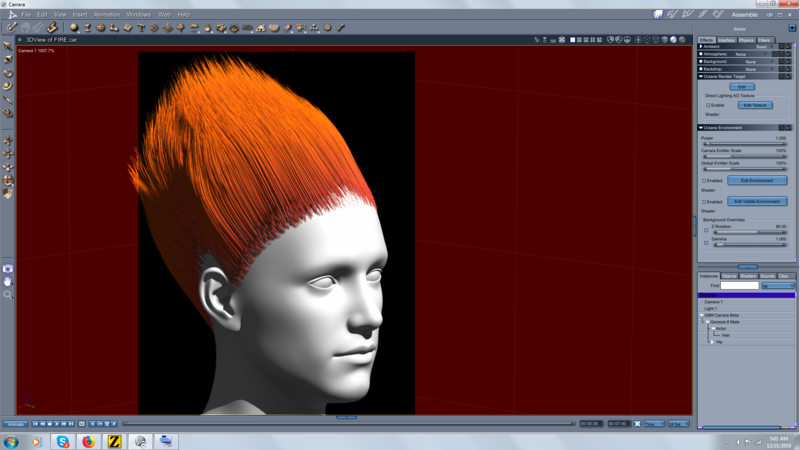 I am attaching a test render and screencaps of the hair model room and the hair shader tree. In the hair shader, note that I have placed mixers in the channels for root and tip, and I have nested another mixer in one of the tip mixer channels. Hope that makes sense with the screenshot. In my experience, the appearance of hair is very sensitive to the number of lights and the values of the shininess and highlight channels. 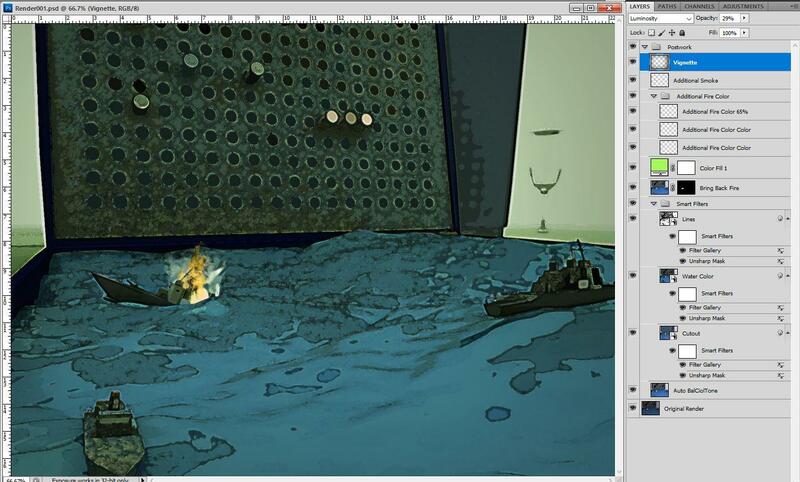 Generally, I lower those values the more total light is in the scene. One final unsolicited note, you can use the multipass renders to aid in the final appearance of your hair. In particular, I recommend that you include a volumetric primitive pass, which will generate two passes. In this case, because the hair is the only volume primitive, it generated a render of the hair against a black background (including the mixed hair shaders) and a render of the hair as black against a white backround. One example, if desired, you could use the black/white pass as a tool to aid selection of your hair in your favorite image editor if you wanted to do some postwork. These are all looking teriffic, great work everyone! Hope everyone enjoys their holiday, wherever you are!! This is an illustration from a book I am doing. This particular render gave me a great excuse to use Head Wax's awesome (and free) Storm Creek product (the rain and puddle part). The morphs are outstanding. You can make a very fine rain, but I went for one that was thicker and nastier. All the figures are M3, and the outfits are from Wild West. The buildings are various structures in the Old West series. Vicky's brain is used for the background bluffs. Various objects were modified in the modeling room. Carrara internal processes include Volumetric Clouds, Displacement, GMIC, and Toon 3. Great work from everyone so far - some very inspiring stuff! I've got an idea for this one and meant to work on it today, until my mom's computer "freaked out" and I had to go do tech support. Turns out the motherboard was bad - or at least that's the most likely issue after about two hours of Google search led troubleshooting and fix attempts. Since it was just a cheap email-and-solitaire desktop and about eight years old I went out and bought her a new one and spent the day tranferring all her files from dropbox (sooo glad I set that up for her, so I didn't have to figure out how to get her files off the old computer which just keeps restarting every few seconds), installing updates and software, etc. Fun. So, hopefully tomorrow I can get something started . Hope your holiday season is full of wonder and joy. Looking forward to the air elemental. I went to see a movie the other day, and the showed preview of another Lego movie sequal - had to think of your spiffy models. Excellent. I will be learning even more with your project, which is always a great thing. Beautiful work, UB. However, your brains are not unified. Nyuck, nyuck, nyuck. Very clever of you to make the hills from the brains. Glad to see use of the volumetric clouds. Did it give you any trouble? Any insights on how the fared with the GMIC filters or Toon 3? Any tips to share? Well, at least you were able to avoid catastrophic file loss. My mom uses hers for pretty much the same limited set of functions. We are trying to transfer her to a tablet. There seems to be more hassle from updates/outdates/virus/installation etc. on her desktop. Looking forward to your project. Still lots and lots of time. Your hair looks great. I especially like how the tips have a very natural unevenness. I was just offering some ideas to experiment with. That looks great UnifiedBrain! Vicky's Brain? Very clever. I've never used the figures, do they actually come with internal organs or do you buy that seperately? I used the Ocean primitive for the water and the Fire primitive plus Primovol Rising Smoke for the smoke. The board is modeled in Carrara (the peg holes are just a texture made in Photoshop) and the ships are all from the included Carrara content. Lighting is an HDRI and I used the Distance Fog under Atmosphere to fade out the background. I threw the wineglass in just to fill in that big empty spot in the background; it's a spline object I made some time ago for another image and had saved in my object tray. Awesome idea, scene and use of elements in Carrara MDO2010! @MDO2010 - I loved that game when I was little! Love it. Very cool use of objects from the browser. We've had some challengs to use that stuff. 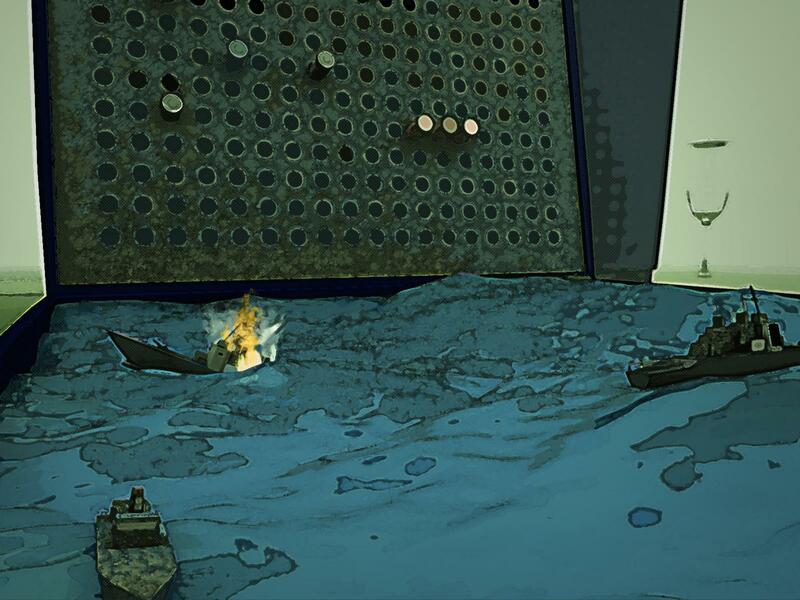 One minor suggestion, completely unnecessary, and just confirms what a game nerd I was, but maybe you can place some "hit" cylinders on the sinking ship like the game, even if it is just columns of smoke? Can definitel understand if you don't want something like that because we are seeing the ocean through imagination, but it came to mind. Beautiful work, UB. However, your brains are not unified. Thanks Diomede! Yes, the brains are not unified, and that is the point. The book will provide context to help recognize the elements in the render, but without that context, the elements are probably less obvious. 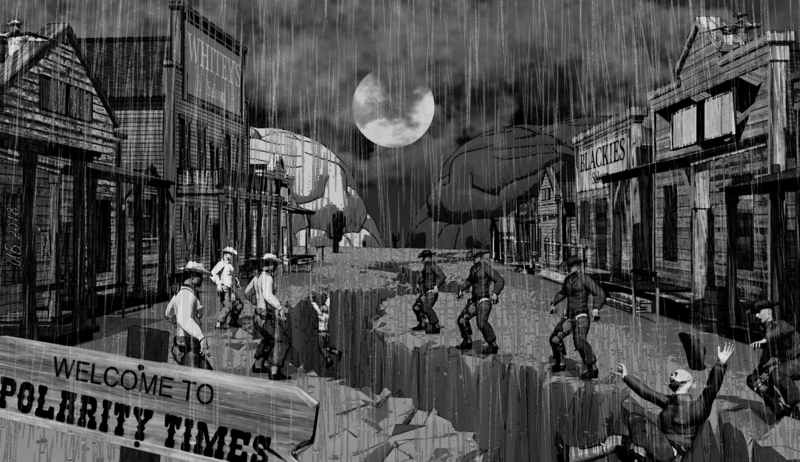 The render reflects the division in society we currently experience, through the metaphor of an old West setting. And further, the theory is that the hyperpolarization we experience today originates from a breakdown in brain hemisphere cooperation. In other words, the polarization within directly influences the polarization without. Very clever of you to make the hills from the brains. Thanks guys. The idea was to make the brain look like hills, yet still be recognizable as brain hemispheres. DesertDude, Daz Brain (which fits V4 and M4) is a separate product. I think that it was the very first product I ever bought from Daz, as I have been involved in researching how the brain works for a long time. Diomede, I am unsure how to answer your other questions. For me, every render is difficult to a degree. GMIC was limited to B&W and contrast. Toon 3 generally applied well to the whole render, but as you know, the line effect can sometimes be too thick, and the toon effect too blocky. Both effects were either reduced or excluded in the M3 characters (but not the clothing) and on a couple of other things, for purposes of making those items appear less muddy looking. The fact that we can adjust the degree of toon effect on individual items in Carrara, is a tremendously valuable tool, at least for me. 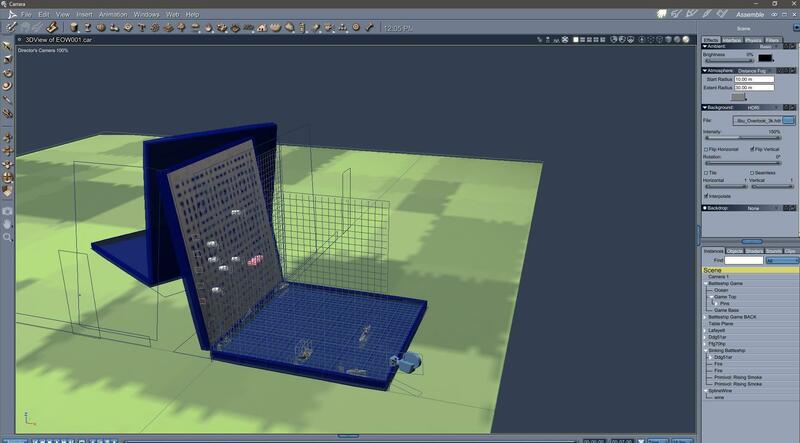 I love the game battleship! ah I missed al the latest posts. Be back after the season is less festive PS UB brilliant work - thanks for doing that!